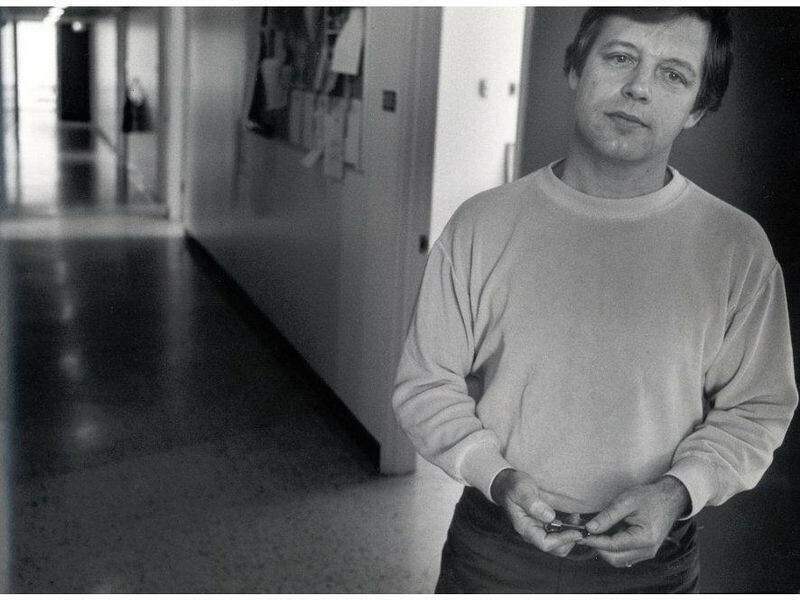 Larry Roberts (1937–2018) was honored as a CHM Fellow in 2017 for his seminal contributions to the evolution of our connected world. Following his early work in computer graphics and networking he was chief architect of the ARPANET, the US Department of Defense network that was a key building block of the later Internet. He was a champion of the x.25 networking standard, and a principal of the pioneering commercial networking corporation Telenet. Larry Roberts (1937–2018) and his cofounders flew to New York for the IPO of their fast-growing Bay Area networking company, Telenet. They gave speeches on the stock exchange floor and in general savored the triumph of this recognition in dollars and shares for their five years of pioneering work, from raw startup to international communications carrier. There were thrilling possibilities on the horizon. Telecommunications giants like BT and Bell Canada as well as major manufacturing companies wanted to buy the innovative switches Telenet was manufacturing, based on a new international standard they had pushed through a normally glacial process in record time. Their own networking services were used by all manner of corporate customers. The year was 1979. Telenet’s triumphant IPO was partly based on Larry’s track record for helping pioneer different aspects of networking at appropriate times, from the mid 1960s onwards. Networking itself was exploding. In less than a decade, it had gone from specialized military uses and a few experiments like the early ARPAnet (which Larry played a key role in), ALOHAnet, and the English NPL Mark I network, to an emerging industry. By the mid-70s Telenet and competitors like Tymnet and CompuServe were offering network services that spanned the globe, for corporate customers and startup services alike. DIALOG and LEXISNEXIS offered Google-like search to the few customers who could afford their punishing hourly fees. Every major computer maker had its own nascent networking standard, from IBM’s SNA to Xerox’s XNS to DEC’s DECNET. Every major telecommunication company was thinking about how to connect computers to each other, both to serve customers and for their own infrastructure. Some, like BT and France Telecom, were even poised to offer Web-like Videotex services to the general public. Large corporations were starting to try and network their own scattered computers and timesharing systems. But within months of Telenet’s IPO, it was clear that even this audacious new public company was too small to get its arms around the revolution it had helped launch. It was a dilemma that would become familiar to other net entrepreneurs a generation later. Telenet had helped establish a market that was growing too fast for its own abilities to scale. Larry and his cofounders sold the firm to GTE in 1980 for $60 million. The son of two PhD chemists, Larry Roberts had grown up tinkering with chemicals, electricity, and machines in the basement of their home in Westport, Connecticut. He made nitroglycerin and brought it to school when he was in first grade. He had read up on the needed steps in his father’s chemistry books. Luckily he didn’t cool it enough, and the chemical did nothing when he tried to set it off on the school grounds. Even though his parents had both met in their graduate chemistry program, his mother followed the conventions of the time and stayed home with the children; she never used her degree professionally. But she volunteered for all manner of causes, including founding a number of Girl Scouts camps. One of them needed a telephone system, so when he was in college Larry designed a switch using transistors, which were quite new at the time. He had also built a mechanical telephone switch in his dorm for communicating with friends, through which he found a way to get insider access to long-distance lines and talk to his family for free. He had entered MIT as an Electrical Engineering major, and went on to a masters and doctorate in the same subject. His early self-education in chemistry had almost been too good; he felt the field was “…sort of passé, it was sort of pretty well understood.” He thought electronics would have the biggest impact. But he wasn’t thinking computers – yet. He used an IBM mainframe for a project in his senior year, but was underwhelmed by the batch processing and the punched cards. The epiphany came in the form of Wes Clark’s TX-0, one of the first interactive, single-user computers. At Lincoln Labs, the government research lab with strong ties to MIT, Larry got obsessed with that revolutionary machine. He put in over 700 hours in the first year, building an OCR program using neural network principles. That work became the basis of his first published paper. When Wes Clark abruptly left Lincoln in a disagreement over research priorities, his group, the TX-0 computer, and the nascent TX-2 were left leaderless. Larry in effect took over the effort, even though he was just a graduate student. He himself wrote an operating system, compilers, and other software for the TX-2. 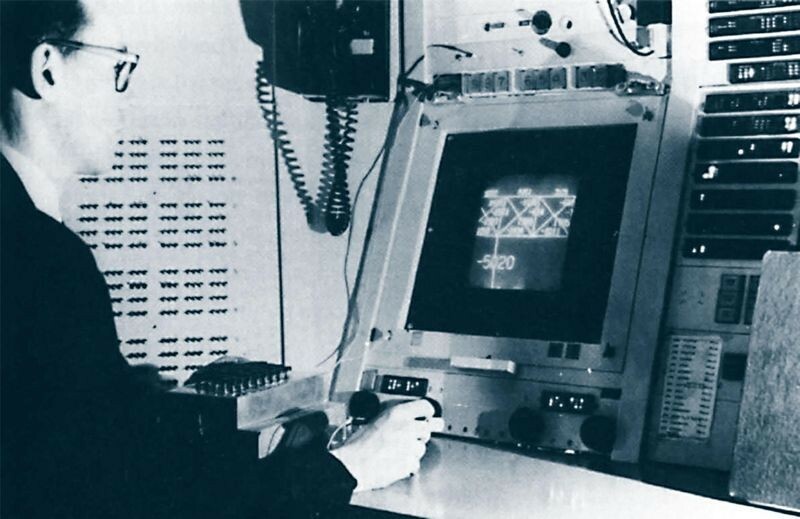 With his classmate Ivan Sutherland, he began using the machine to explore both graphics and alternate input devices. 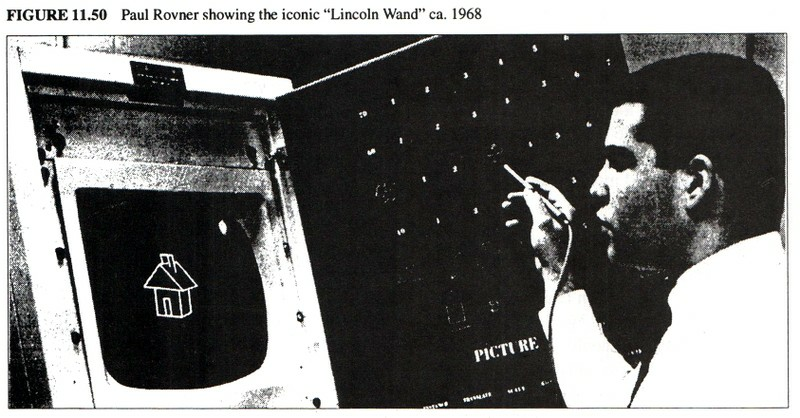 The Lincoln Wand, as they called it, was an ultrasonic pointing device that looked like a magic wand and could freely manipulate three dimensional virtual objects. A couple of years later, when Ivan began working on the first virtual reality helmet with input from Larry, the wand let you directly see whatever you were pointing to. But at the start it was already useful for manipulating objects on the screen, and a convenient way to define buttons anywhere within arm’s reach. You could paste a piece of paper on a nearby wall, and pointing to it with the wand would activate whatever function you had set up. Larry did his thesis on machine perception of shapes, using how humans perceive solid objects as a model for 3D computer graphics. He published the results. Ivan Sutherland’s thesis was Sketchpad, the graphics program that is the ancestor of all the thousands of others that exist today. By writing machine code and having an intimate knowledge of the hardware of the TX-2, Larry and Ivan were able to explore graphics that would not become practical on other machines for years to come. The 3D objects for Larry’s thesis were wireframes, which was all even the TX-2 could handle. But they were fast, and he was fully calculating their surfaces and the intersections between them. The only obstacle between that and rendered 3D graphics like we see today was raw computing power. He needed a new direction. In 1964, Larry went to a conference in Virginia with a couple of MIT luminaries – Fernando Corbato, timesharing pioneer, and computing and cognitive science visionary J.C.R. Licklider. The latter was head of the computing division at the U.S. military’s Advanced Research Projects Agency (ARPA), and was talking about his idea for an “intergalactic computer network” to hook up various ARPA-funded research projects. For Larry, networking wasn’t completely out of the blue. 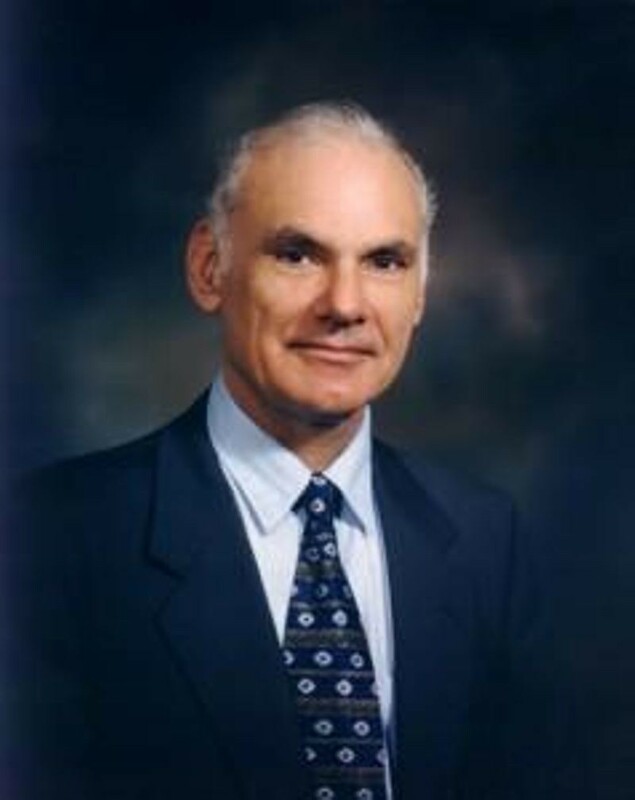 His MIT roommate, Len Kleinrock, had done his thesis on statistical and theoretical aspects of future computer networks. Larry himself had built those telephone switches as an undergraduate, and fiddled around with transmitting scanned images of Old Master paintings to other computers for AI pioneer Marvin Minsky as part of his graphics work. He’d even set up a phone line connection between the TX-2 and a distant living room so that Amar Bose, future founder of Bose Corporation, could process acoustics. 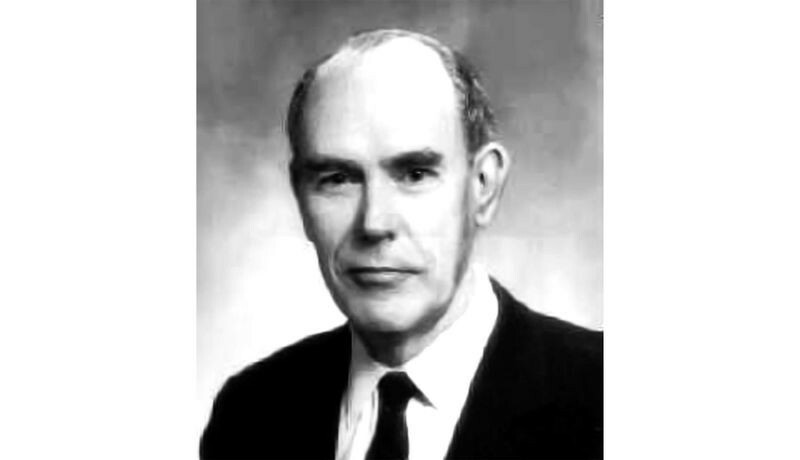 Larry’s classmate Ivan Sutherland had just taken over Licklider’s old job heading the computing division at ARPA. He was happy to set Larry to work on experiments in networking the TX-2 at Lincoln Labs to computers in California. The results were promising, and life was good. Larry was ensconced at Lincoln, with unlimited access to what he considered “…the best computer in the world.” His ex-classmate Ivan was funding him for exactly the research he wanted to do, and that continued even after Ivan left and was replaced by Licklider’s protegé and deputy Bob Taylor. The one thing that could disturb Larry’s idyll turned out to be blackmail. 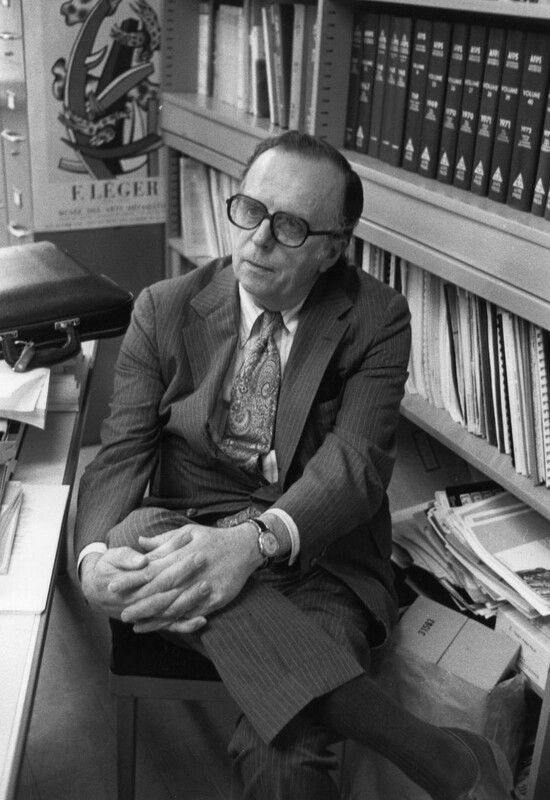 With backing from the head of ARPA, Charles Herzfeld, Bob Taylor had decided to turn Licklider’s vague, someday idea of a computer network for ARPA researchers into copper and steel reality. He wanted Larry to oversee the technical architecture. But Larry was loath to leave Lincoln and the TX-2, especially to take what he suspected would be largely a management job. Worse in his eyes, it would be one working for a man without much technical knowledge or even an engineering degree, much less a doctorate. Bob was trained as a psychoacoustician like Licklider. After several refusals from Larry, Bob remembered that Lincoln was a recipient of ARPA funding. He talked to Hertzfeld, who asked the head of Lincoln to convey to Larry that it would be in both of their interests if he took the job. The work didn’t turn out to be nearly as dull as he had thought. The first task was to convince a gaggle of mostly reluctant ARPA fundees that they should share some of their computer’s precious resources with others. For men who had fought endless bureaucratic battles to have a computer at all, this could be about as appealing as a request to just share say, just 10 or 20% of your wife. It got worse. Their labs would also have to write the interface to the network themselves, with their own time and graduate students; the research-world equivalent of carrying one’s own cross. With a mix of rewards and threats, Larry and Bob managed to ram the project through. One key technical decision made the crosses a little easier to bear. Instead of connecting all the researcher’s/their mainframe computers directly to each other, ARPA decided to give each one an intermediary – a dedicated minicomputer that would act as a standard interface to the network. 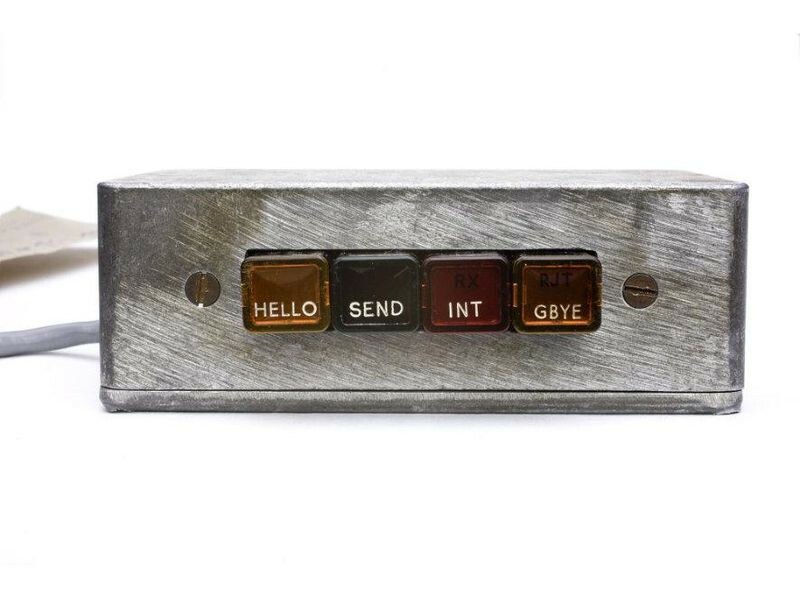 These Interface Message Processors (IMPs) were the suggestion of Wes Clark, the designer of Larry’s beloved TX-0 and TX-2 and a champion of small computers. Each laboratory would only have to worry about writing software to get its mainframe connected to the IMP. Another technical turning point was Larry’s decision to implement the newish idea of packet switching. Instead of the direct user-to-user circuits of a telephone network, a packet-switched network acts more like a postal system. It breaks information down into tiny packets that can then take their own individual routes to the destination, where they get reassembled. For computer communication, which tends to have bursts of activity followed by long silences, using packets can be far more efficient. Roberts and Taylor chose three centers to be responsible for critical parts of the new network, which they had prosaically named “ARPAnet.” Frank Heart’s team at Bolt, Beranek and Newman in Boston won the bid to create the IMPs and some of the basic software. Once the system was up, they would act as the overall Network Operations Center (NOC)—making them perhaps the world’s first formal network administrators. 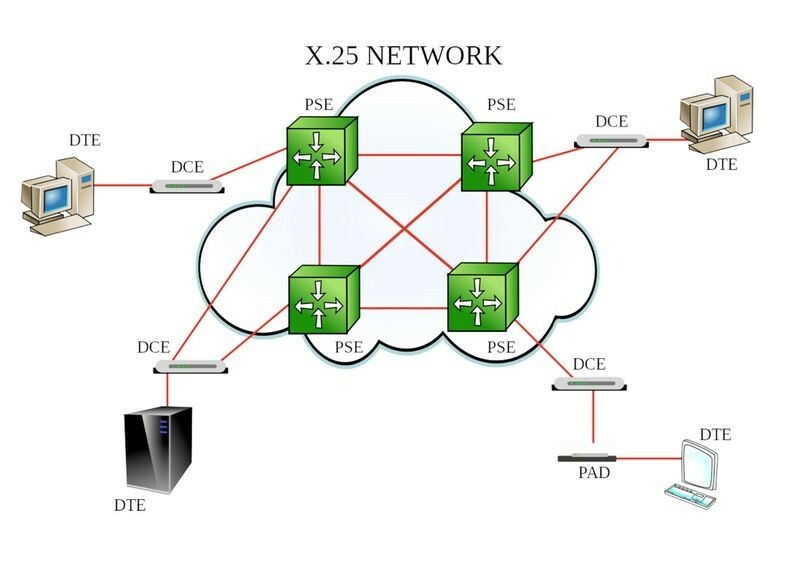 The choice for the Network Information Center (NIC) was an easy one. Doug Engelbart’s lab at SRI had been one of the only ARPA-funded projects to show actual enthusiasm for joining the new net. Doug’s NLS (oNLine System) was a foretaste of the computing world of today, with users collaborating on documents, browsing remote documents, exchanging electronic mail, and clicking on hypertext links with a mouse. He saw a chance to expand the reach of NLS from dozens of users on individual timesharing systems to thousands, all over the country and beyond; the start of a true online world. The NIC would act as a central library and card catalog for all of the information about and available on the network. It would also host the central directory for all of the computers that made it work/were part of it, a function which later evolved into the familiar Domain Name System (.com, .org, etc.). Completing the triad was the Network Measurement Center (NMC) at UCLA, in the lab of Larry’s old MIT roommate Len Kleinrock. The NMC was in charge of both measuring and predicting the various theoretical issues about how data might flow – or collide – over the net. Their results would help shape the kinds of rules and “traffic signals” the new system might require to run smoothly. It was loosely through the NMC that a group of graduate students coalesced around the task of writing the basic protocols to make the ARPAnet work. Their informal group process would evolve into the system that still runs the Internet standards process today. 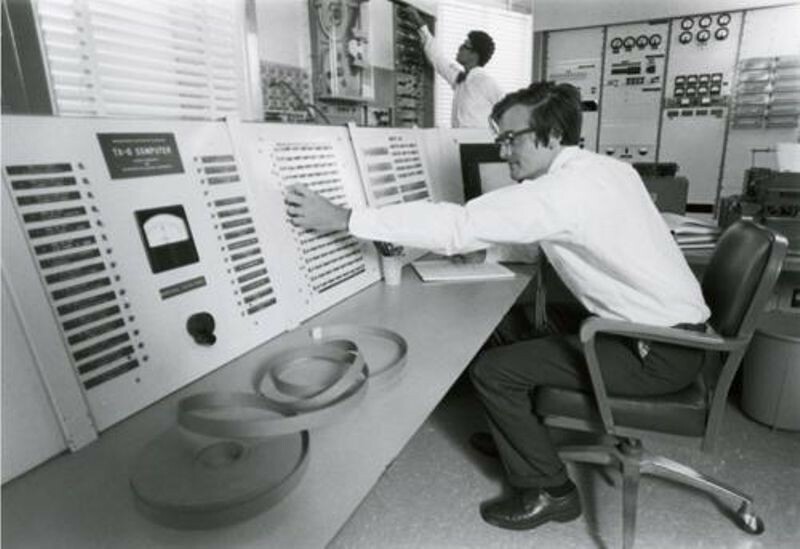 By the end of 1969 the ARPAnet was connecting its first two mainframes, at SRI and UCLA. It was around this time that Bob Taylor left ARPA and Larry took over as head of its computing division. Within a year there were at least two other packet-switched networks booting up. One was the brilliant but under-funded Mark I network at England’s National Physical Laboratory, the brainchild of Donald Davies. Another was a project Larry and Bob had also funded from ARPA, but using radio waves instead of wires. 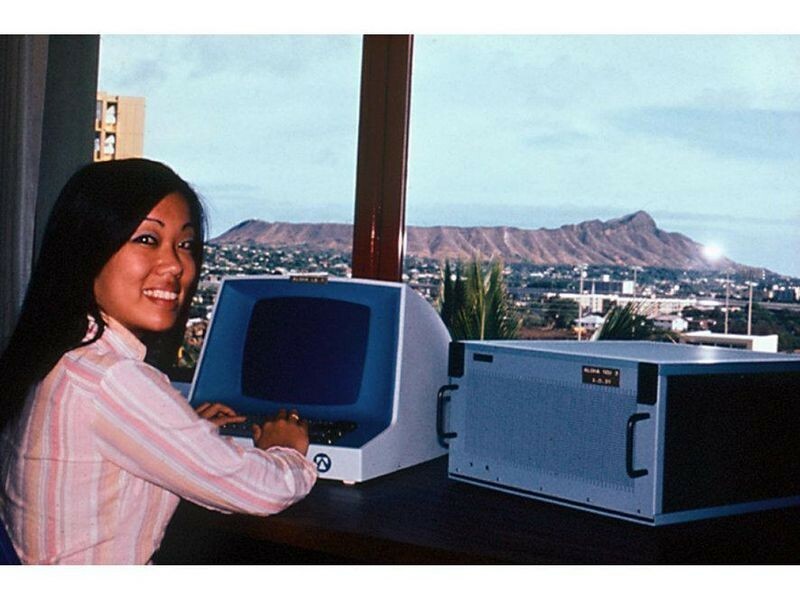 ALOHAnet in Hawaii was the direct ancestor of the digital data networks that surround us like an invisible umbilical cord today, from mobile phones to Wi-Fi. Larry was intrigued. He contributed a number of key technical ideas to ALOHAnet and its protocol. Along with some of the ALOHAnet folks he began thinking of a smartphone-like mobile terminal that would let you take the power of networking anywhere, and a wider network to support it. And beyond terrestrial radio, there was space. Larry began thinking about a packet-switched network that could bounce from ground stations to satellites and back, reaching across continents like skipping a stone on a pond. It was Larry’s successor at ARPA, Bob Kahn, who would build out those interests into the Packet Radio Network (PRNET) and the Satellite Network (SATNET). Along with the ARPAnet these would be the components of ARPA’s first Internet, the one we use today. For Larry, the horizon that beckoned was the marketplace. He felt that the next phase of the networking revolution would not be in the research lab, but out in the world where corporate users and the public could begin to share the connectivity that was already a familiar friend to networking researchers. One soon-to-be popular feature of that connectivity was electronic mail. While most timesharing systems had offered some form of mail since the early 1960s, it didn’t go beyond at best a few hundred users of that particular system. Following the lead of Ray Tomlinson and others, Larry wrote some of the code that helped adapt electronic mail to the ARPAnet. He left ARPA not long after, in 1973, to be the founding CEO of Telenet. The firm had started as an offshoot of BBN (Bolt, Beranek and Newman), the firm that built a good chunk of the original ARPAnet. They had recognized early on the need for commercial versions of that research network. We’ve already seen at the start of this piece what happened, with the launch of the x.25 standard, and Telenet’s IPO and $60 million sale to GTE. Since then, Larry Roberts has served as CEO of DHL, and founder and CEO of five network equipment startups: NetExpress, ATM Systems, Caspian Networks, Anagran, and lately FSA Technologies. The Computer History Museum honored Larry Roberts in 2017 for his contributions to human and machine communications and for his role in the development of the ARPANET and the X.25 protocol.